Posted on Sat, Mar 24, 2012 : 1:47 p.m.
Amtrak plans to alter schedules for some trains - including one traveling through Ann Arbor - and make temporary route adjustments as it deals with lower speed limits imposed because of poor track conditions. 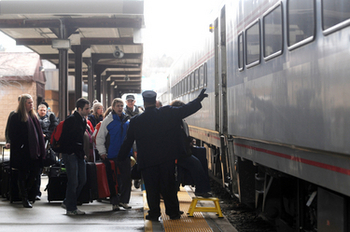 Passengers prepare to board an Amtrak train in Ann Arbor in this file photo. The slowdown order, announced March 15, requires trains to slow to 25 to 30 mph. Amtrak can normally operate the trains at 79 mph. Beginning on Monday, Train 355, the evening westbound Wolverine, will operate 65 minutes earlier than its regular schedule and will originate in Dearborn rather than Pontiac, Amtrak said. 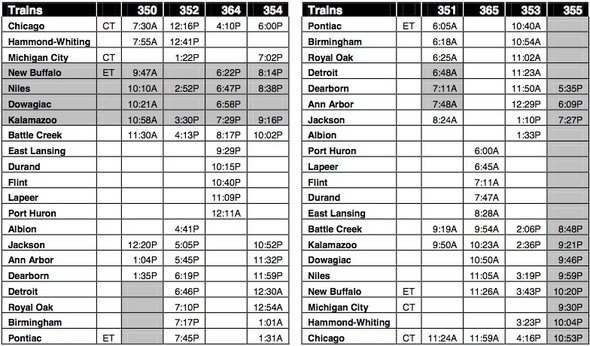 The train will depart Ann Arbor at 6:09 p.m. under the new schedule. Its departure time was 7:17 p.m. under the old schedule. Amtrak also said Train 350, the morning eastbound Wolverine from Chicago, will end its service in Dearborn rather than Pontiac. Trains have been running 45 to 90 minutes late in the affected areas since Norfolk Southern ordered the slowdown between Kalamazoo and Ann Arbor. Norfolk Southern, which owns part of the tracks on which Amtrak operates, said it was necessary for passenger safety because of deteriorated track conditions. Amtrak spokesman Mike Magliari said trains between Kalamazoo and Ann Arbor for which schedules have not been altered will continue to run late until the tracks are repaired. At the Amtrak station in Ann Arbor Thursday evening, passenger Geraldine Smith of Ann Arbor was taking the delay in stride. She had just gotten off the westbound train from Chicago, which was more than 90 minutes late. She said she keeps a roll-with-the-punches attitude about travel. “If you don’t, your blood pressure goes up,” she said. Norfolk Southern is preparing to start repairs to the tracks in early April, Amtrak said in a news release. Amtrak will make more schedule changes as that work begins, the release said. The work is expected to be completed before the end of spring semesters at colleges and universities along the route, Amtrak said. Amtrak said it has also made temporary schedule changes in Western Michigan for the Blue Water (Trains 364 & 365), which uses Norfolk Southern track between Battle Creek and Kalamazoo. Contact Cindy Heflin at 734-623-2572 or email her at cindyheflin@annarbor.com or follow her on Twitter. Sun, Mar 25, 2012 : 3:09 p.m.
Sun, Mar 25, 2012 : 8:19 a.m. They REALLY need to get this situation FIXED...fast. Five to six hours to arrive in Chicago from Ann Arbor is plain ridiculous. Sun, Mar 25, 2012 : 2:39 p.m. It can take 5 to 6 hours to drive to Chicago, and even worse if you are going into downtown Chicago, considering the traffic. What are you complaining about. The time you spend on the train is your own. You can sleep read, browse the web, whatever. No stress, no strain. Besides, have you even thought about what the gasoline costs for that trip? The train usually costs less. There is no way I would consider driving to/from Chicago. Sat, Mar 24, 2012 : 9:55 p.m.
Amtrak owns the stretch of track from Kalamazoo to Porter, Indiana. This winter, it completed a project to raise track speeds to 110 mph on that section. This is a real accomplishment. That section of track is now one of the fastest outside of the Northeast Corridor. The section of track between Kalamazoo and Dearborn is owned by Norfolk Southern. It's in negotiations to sell that track to the state of Michigan. The slow orders a dubious. A negotiating tactic, perhaps? Sat, Mar 24, 2012 : 9:33 p.m.
All of the track between Kalamazoo and Ann Arbor is bad? Really? Sat, Mar 24, 2012 : 11:16 p.m.
Don't forget, freight trains run on the Norfolk Southern track too. Nothing is said about freight trains ordered to slow down. They are longer than passenger trains. Sat, Mar 24, 2012 : 9 p.m.
Norfolk Southern hasn't completed the sale yet and, just like last year, is using &quot;track maintenance&quot; as leverage in the sale. Shameful. Sat, Mar 24, 2012 : 7:34 p.m.
More details please.... Does this have anything to do with the 110mph upgrades? How does this tie in with the high speed rail, transfer to MDOT NSC, etc. What about the &quot;big picture&quot;? Sat, Mar 24, 2012 : 6:53 p.m.
is, or is not, NSC selling the line to MDOT? Sat, Mar 24, 2012 : 7:09 p.m. Yes, the state has been in talks with Norfolk Southern about purchasing much of the line. The purchase is expected to be completed later this year, subject to federal review, Amtrak said. I understood Amtrak last year purchased the right-of-way from Detroit to Chicago with a plan for high-speed rail. How does Norfolk-Southern still own the track?